Grand plans are funny, then you find out a family member is having a baby! I have a neutral in the mix, too. I had the perception that I didn’t finish much in 2013. 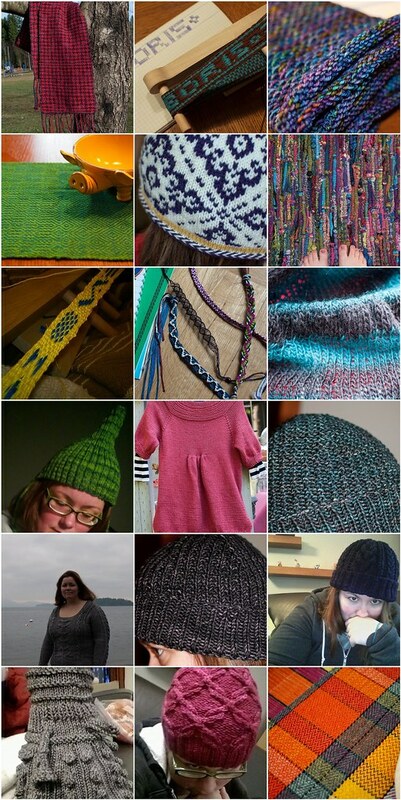 Imagine my surprise when I browsed my Ravelry projects and discovered 18 projects completed in 2013. Not too shabby. 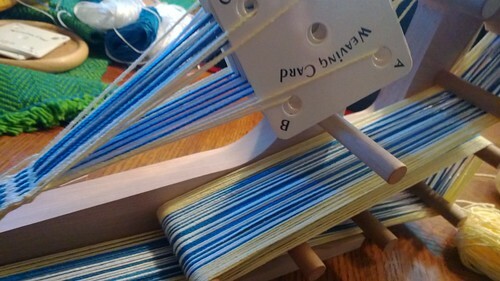 Sure, a few of them were more learning experiences (the inkle loom projects) but I did complete them. 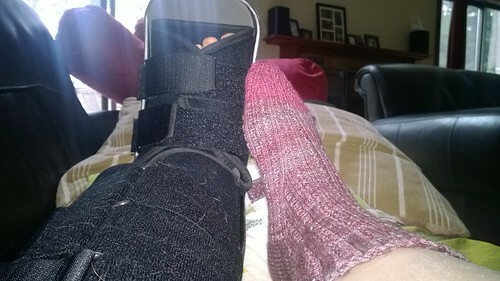 I had ankle surgery on Wednesday. My mom flew out to help us out for a week (so nice, we are lucky! 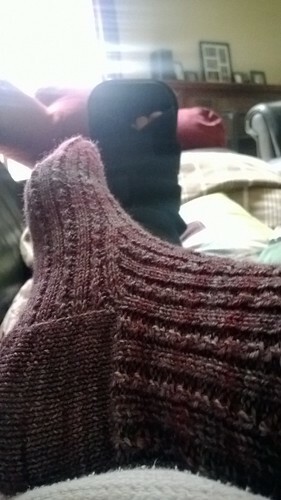 )… bonus for me: she gave me a pair of socks she knit! They’re the Knitty-published pattern Java [ravelry], knit in Sanguine Gryphon Bugga that (I think) she picked up at MD S+W a few years ago. I’m a lucky woman, indeed! N asked for placemats like ones E has. 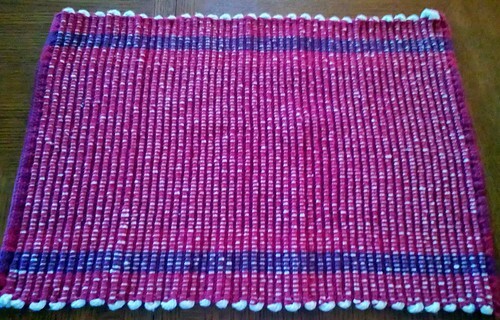 I wove one on my table loom, cut it off, hemmed it, washed it, dried it. It was the right size and it looked similar to what he requested. 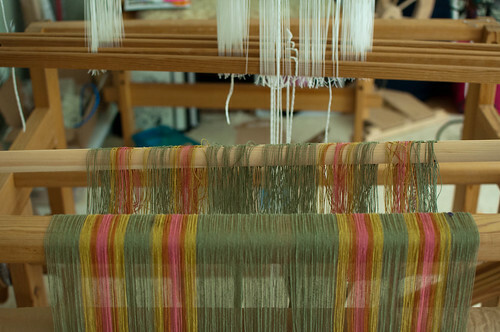 So I tied the warp back onto the front and started the other three, with details about the length to weave the hem portion as well as the body of the placemat. 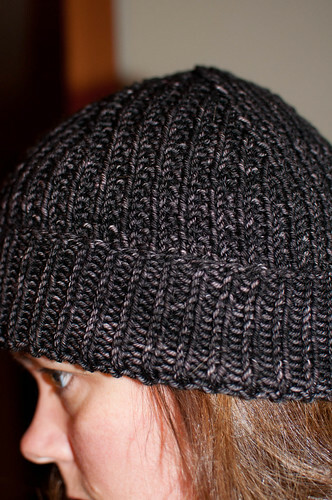 It’s not truly REP weave, but it does utilize a thick yarn alternated with a thin yarn as weft. Simple but looks interesting and has a great texture. 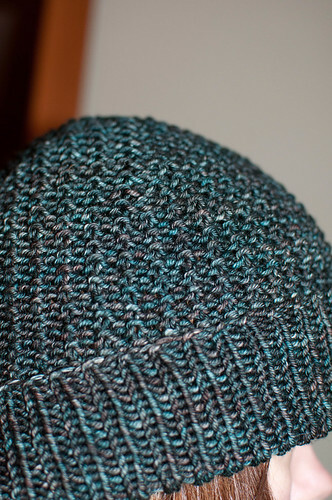 I used the book Rep Weave and Beyond (checked out from the library!) 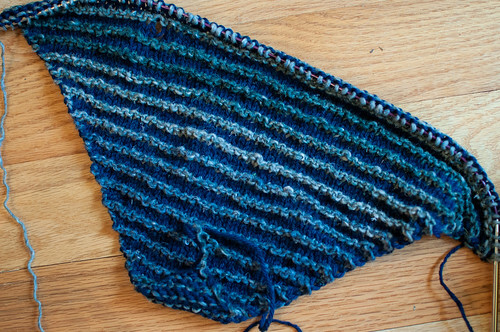 for reference, but this is from a rigid heddle kit from Cotton Clouds. Since this is on my table loom which doesn’t require my ankle to be functional to use, I have no excuse for not finishing the other three placemats yet. D’oh! 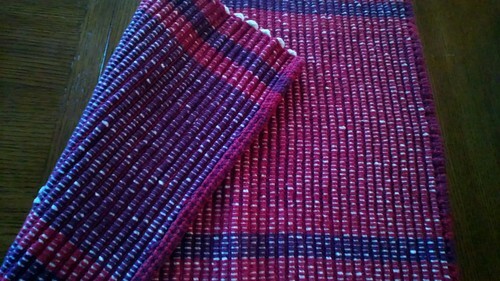 I tried tablet weaving a few months ago because I love tablet woven items. 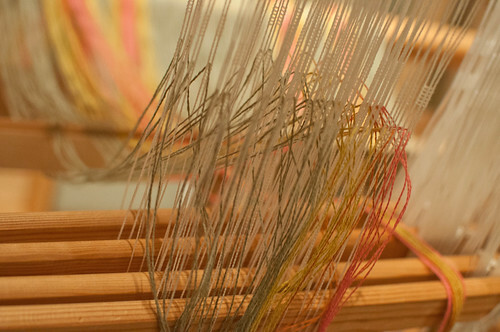 I hated tablet weaving though! 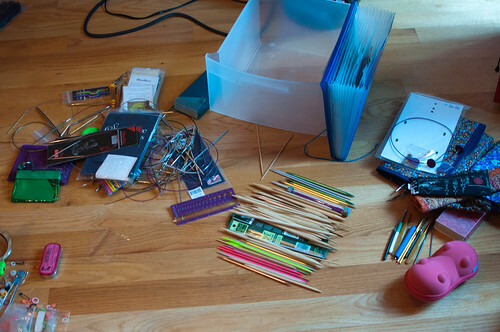 I’ve been meaning to re-organize my knitting needles and crochet hooks and notions for a while. I finally got tired of the tangled mess of circulars and piles of mismatched double pointed needles and over the course of a few nights, reorganized everything. I ditched some of the stitch markers that I hate and consolidated the ones I love. 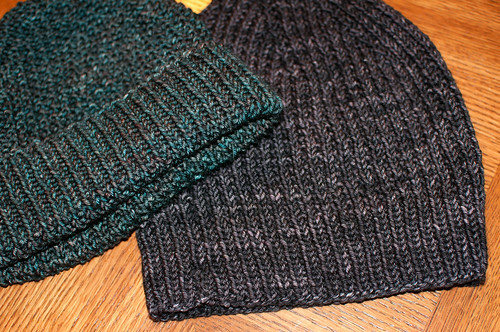 I sorted the needles properly, keeping the knit picks interchangeables (which I have started to really hate) separate from the Hiya Hiya interchangeables (which I find myself fighting with all the time due to the swivel join) separate from the Dyakcraft Heavy Metal needles (too bad they are too heavy in larger needle sizes) separate from the fixed needles and the Signature convertible (which I find is not slick enough for me). 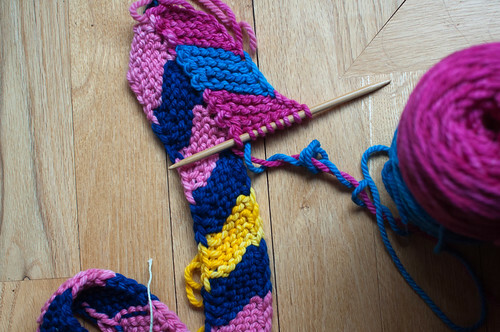 Yea, I am feeling rather Goldilocks with my knitting needles lately. But yay! All my knitting needles and crochet hooks and notions are tidied up. Does anyone want a needle tatting mini kit? Never opened. Let me know! 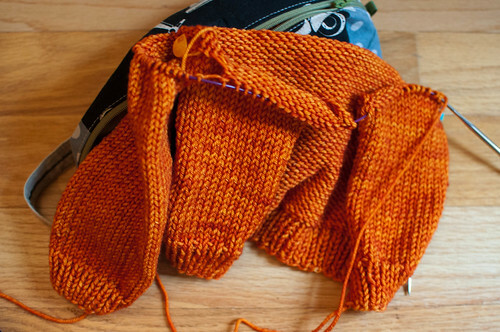 A few days after I finished my Ambergris, I started Thea Colman’s design, Rolling Rock [ravelry], in Cephalopod Yarns Bugga!, 8 Spotted Crab Spider. I’m a sucker for a henley and I’ve been craving some simple lace. 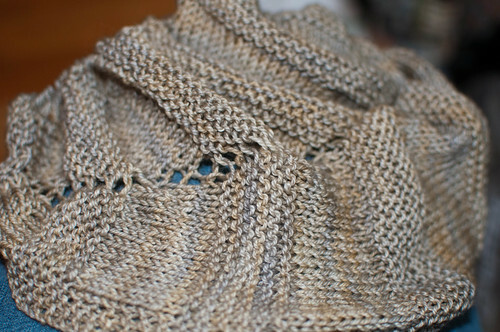 A sweater in sportweight yarn (on US3 needles!) 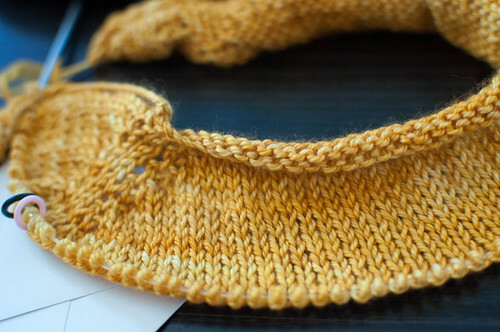 may be difficult for me to complete, but so far it’s interesting because this sweater is knit top-down and uses Susie Myers’ unvented contiguous sleeve structure [ravelry].